I’m always amazed by how economical legumes are as a food source. There are good reasons why they’re the backbone of many cuisines – they dry well, store for ages and are extremely nutritious. Tinned beans, chick peas and lentils are reasonably priced and readily available, but the dried versions are so cheap that they make the tins look like an extravagance. Once every few months, we’ll cook up a giant batch of black beans and chickpeas, and stock the freezer with meal-sized portions. Last night, I soaked 2kg of black beans and 1½kg of chickpeas. The legumes absorb a surprising amount of water, so it’s always worth allowing a bit more than you think is necessary. I added a teaspoon of bicarbonate of soda (baking soda) to each batch, as it’s supposed to help reduce the “windy” factor. This morning, I emptied out the soaking liquid and tipped the chickpeas into a large pot. I added fresh cold, unsalted water and brought the pot to a boil, skimming off the froth and stirring occasionally (salt can toughen the skins of the legumes). After nearly an hour, they were bite-tender but not mushy – note that the boiling time will vary enormously depending on the age of the dried legumes. The drained chickpeas were rinsed well in cold water, then packed into boxes for freezing. If you have a free couple of hours and some freezer space, stocking up on cooked legumes will ensure a regular supply of easy, economical, and most importantly, healthy mid-week dinners. I’m a big fan of lentils, chickpeas and beans for tasty, healthy, frugal meals too but hadn’t thought of cooking dried chickpeas and freezing, great idea. Your recipes, espec that breakfast soup, look wonderful too! This is awesome, Celia! I just brought home a nice big bag of both dried black beans and chickpeas, with the intention of prepping them for the freezer. Your post is such a welcome incentive for me to get going on this! I find the flavor is so much better when you do up your own, and the savings is absolutely grand! BTW: Why did you put the chickpeas in a plastic container and vacuum seal the black beans? Oh, I thought it must be something significant. Habits are funny. The chickpea curry looks like a great weeknight option! I love chickpeas, lentils and beans and the idea of cooking a large batch and freezing is wonderful. A variation when cooking the chick pea curry with the indian spice chana masala. You could either blend the tomatoes with a little ginger and garlic and add it to the sauteed onions until the raw smell of the paste disappears. Then add your spice and fry it well and add your chickpeas and a wee bit of water if required. Garnish with ginger juliennes and chopped cilantro with lemon wedges on the side. Variation: add a wee bit of dried and powdered pomegranate seeds to add flavour and a bit of tang to the dish. Garnish it with julienned fresh ginger and half a teaspoon of dried fenugreek leaves crushed which should be available at the indian grocers. This is one of my favourite chickpea dish. I am from a place in Goa on the west coast of India and I love cooking chickpeas in different ways. Monica, thanks for the great tips! I’ve got some pomegranate powder in the pantry, and there’s some in the mix as well. I love how the packet gives me a carefully blended range of flavours that I’d have difficulty copying! I love the idea of pureeing the tomatoes with ginger and garlic, thank you! Chica, my friend Barbara at Harkola does the same thing – soaks and freezes, then cooks from frozen. I’ve tried both, and just find that freezing the cooked chickpeas works a bit better for us! Lovely legumes! I cook chickpeas in bulk as well and freeze but there are never as many get into the freezer as should. I eat them in handfuls out of the colander! Pat, my mother tells me that I was eating boiled chickpeas by the handful when I was two – it’s been a favourite of mine all my life, and I never seem to grow tired of them either! Great post Celia. Watch out legumes. Your time in the cupboard is at an end!!! I love this Celia! Thank you! I’m on a mission to stock both our freezers nice and full over summer, this is another thing I can add! Charlie, tinned beans never seem as nice as the rehydrated and boiled version, not sure why that is. Having said that, we always keep tins in our pantry for when we run out of frozen! :) And yes Blacko, Charlie needs a bigger freezer! I just did a batch of chickpeas and a giant batch of black beans yesterday! Great minds think alike & all that. ;) The vacuum sealed bags look like an awesome way to store them – do you love your vacuum sealer? Can’t decide if I really can justify another kitchen appliance…….. Snap! :) Abby, I know exactly how you feel about adding another appliance, our kitchen is full too, but I really, REALLY love my vac sealer. It was a cheapie – $69 – and the bags are quite expensive, but I use it all the time, for vac sealing but more often just to seal up open bags. It lets us buy in bulk and portion out for storage. LOVED reading this post! I rely heavily on tinned beans, but I spent quite a bit of time last week cooking up some beans. And now after reading your price comparison I’m glad I did & might have to make a habit of doing it more often! Sandy, it’s hard to get past the fact that tin beans are just $1 each, but I actually think the homecooked ones taste better! They ARE a lot cheaper too! I was brought up to make and prepare ahead also Celia! The chickpeas idea is a staple in this home where I also soak with the chickpeas (cracked fava beans) & make batches of falafel, flatten in sealed bags & freeze.When ready to cook, they thaw out in mins & quick to make! Also I prep the homous in my blender before hand without the addition of tahini, garlic etc. On the day of serving I add all those ingredients fresh. Your advice is great as not many bloggers would take the time to share this frugal but wise idea. God bless! Lina, this is wonderful! Could you please tell me how you make your falafel – do you grind the soaked (raw) fava and chickpeas, or do you cook them first? I love falafel but have never tried it at home. And great tip to make up the homous and then add the tahini etc later – do you freeze the homous as well? Thanks for the great tips! I too am a huge fan of cooking beans in bulk. I do chickpeas but I also use lots of cannellini beans so have heaps of those in the freezer. I tend to shallow freeze my chickpeas then vacuum pack them so they don’t squish, as I don’t have the room for all those containers. I read somewhere that you should freeze your beans in the cooking water to stop them drying out in the freezer. I did do that with one box of cannellini but have yet to defrost it yet to see if that theory works. You can also soak your beans with a teaspoon of whey or lemon juice, but the key to reducing the wind factor is using massive amounts of soaking water. You are trying to leach out the ‘wind factor’. Make sure you discard this water before cooking. I have never had issues since I started doing this. Thanks for the spice mix tip. Am off to the shops! Thanks Tania, that’s good to know about the wind-reduction, I have noticed that tin beans are worse than the homesoaked and boiled ones. I’ve never tried freezing the beans in their cooking liquid! Wow you are so organised! :o I soaked some dried chickpeas but to be honest, I prefer the tinned because I wanted hummus and I wanted it then, not a day later. But your method of storing them would be a great idea! I never used to like chickpeas, but have developed a huge love for them now. My favourite salad to make is chickpeas, cherry tomatoes and cucumber with a lime and oil dressing. Other ingredients such as olives, feta etc.can be added. I never have a problem with gas since I started soaking in lots of water, and then throwing that water out. Oooh, your salad sounds divine! I love the idea of the lime and oil dressing! You are definitely my inspiration. I’ve been saying I was going to do this for the longest time and I haven’t. I’d much rather have my own stuff in the freezer than buy a tin. This looks wonderful Celia. After your freezing tips, this morning I needed chickpeas for my slow cooker curry and remembered I had a batch in the freezer! Must stock up on dried beans next time I see them. They sell them for a very reasonable price at my local Indian grocer. I’ll look out for the spice. Becca, it seems outrageously cheap, doesn’t it? I’m always looking at the prices of things at the Indian spice shop in awe! Thanks for the mention – much appreciated! You know me – I love beans and chickpeas. 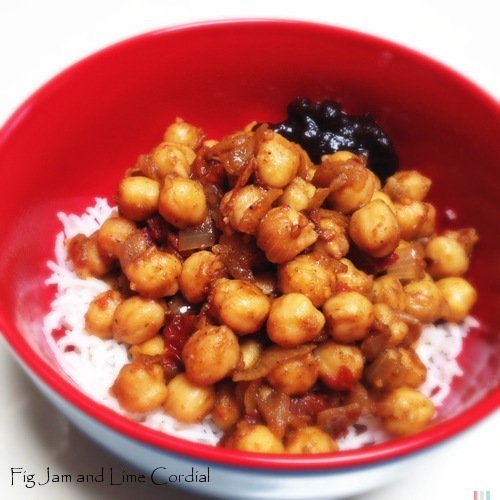 Chickpeas especially – so versatile! I love beans and chickpeas but unfortunately my CPoo does not (he doesn’t like the texture, this extends to peas and corn as well). He will tolerate hommus though, so that’s where my stash of chickpeas usually ends up! I love the sound of Pete’s beans and mince on rice though.. .maybe it’s time to test the bean-eating waters again! Awesome post Celia, much better to do it yourself then have chickpeas swimming in brine in BPA coated tins sitting on shelves for months or years. I do my chickpeas from scratch when I’m making hummus because I can peel the skins and have a smoother dip but have to confess to being lazy and buying the tinned variety for salads etc. I too am a dried beans person, I frequently combine a variety of cooked beans before freezing in meal-size portion, the different sizes and colors make for interesting dishes especially in a salad. Norma, that is a GREAT idea, thank you! It would be very convenient to pull out a single combined bag of beans. Barb, I think a frugal/thrifty meal often tastes better! :) The precooked chickpeas in particular are really useful in so many dishes! what a tasty-looking creation! the egg is a nice surprise and welcome addition. Azita, thank you, it’s a great recipe, although I have to say that I’ve never actually had it for breakfast! Looks great- and it is a good idea. Why don’t I do this? You are a great economical example. Now Celia. You see, I read these posts and think to myself, what a wonderful idea. I buy dried beans and decide that rather than cook them straight away I’ll wait until I need them and then I’ll do extra and stash the surplus in the freezer. But I am too disorganised.I don’t think ahead – well, not more than an hour. So, my dried beans are still on the shelf, the tinned ones have been used and another meal without beans passes. But, I’m going to get down that packet of beans now and leave them to soak tonight. I am committed now! 3 bowls of beans/peas soaking as I type. Yes, thanks freezers are back and all is back to normal (except the power spike when everything came back on blew the fuses on our sewage plant – yeuch). Thank you for this, Celia. It never would have occurred to me to soak and then freeze beans. This makes bean dishes so much more accessible. As much as I like to think that I plan, the truth is many of my meals are more spontaneous. Sometime around mid-afternoon I decide on the night’s meal. Beans aren’t often in the picture because of the prep work required. If I can have a few bags frozen, I’ve a whole new realm of dishes at my disposal. Yay!!!! I like to have a supply of lentils, chick peas or beans cooked and frozen ready to go too, they make a great base for almost any meal. Just as an aside, which may or may not be of interest, the liquid from cooking black beans is great for fabric dyeing…..a multi-purpose legume. Nanette, that IS really interesting! Does the colour set well? It does Celia, although I use the fabric only for art quilts, or items that won’t need washing…journal covers etc…not clothing, so not sure how it would go if being washed regularly. Di, if you like beans, you’d probably like chickpeas as well. Aren’t they called garbanzo beans in the US? All the recipes would work well with canned chickpeas/beans, but it’s nice to have a supply of frozen ones on hand (I do so like having food on hand! :)). This is a really great idea, thanks Celia. I’m always on the look out for frugal food heroes. I’ll be stocking up on dried legumes next time I’m at the shops.